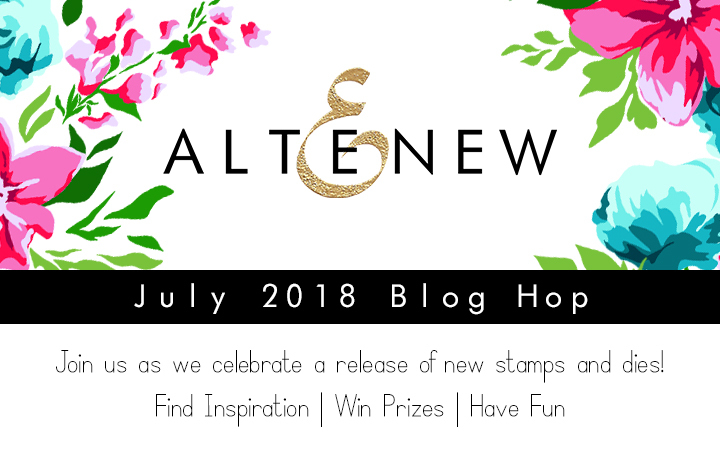 Hello and welcome to the Altenew July 2018 Stamp/Die Release Blog Hop! Hope you came here from Lydia Evans's blog, but if not, please check out whole blog list in the bottom of this post to get more chances to win giveaways on each stops. For my first card, I started by stamping images from Altenew Beautiful Heart Stamp Set onto cold press watercolor paper and cut it out with coordinating die set. I colored images with Gansai Tambi watercolor paints. Next, I pulled out another watercolor paper and ink blended it with Blueprint Sketch, Salty Ocean and Chipped Sapphire, Tea dye and Gathered Twigs Distress inks. I then splattered white ink and Ground Espresso distress ink with clean water to the background. For sentiment from Altenew Beautiful Heart Stamp Set, I gold heat embossed it with Altenew Rose Gold EP onto black card stock and cut it with a scissors. I then die cut a frame from Altenew Reflection Paper Pad using Altenew Leaf Frame Cover Die. To finish, I mounted all elements as shown using various adhesives and applied some Nuvo Crystal Drops to around stamen. For my next two cards, I die cut 3 frames from Altenew Reflection Paper Pad and watercolor paper using Altenew Leaf Frame Cover Die. I glued two of them in opposite direction using Ranger Multi Medium Matte. After I watercolored background lightly using Gansai Tambi watercolor paint, I mounted all frame pieces on it. For more texture, I applied Nuvo Crystal Drops Morning Dew to big sentiment. I made this card as same way using same supplies with previous card. At this time, I teamed up with Altenew Thanks Around the World Stamp Set and Altenew Kind Words Stamp Set. I added glossy effect to big sentiment like previous card as well. Have I ever told you what my favorite color palette is? Here it is. Gold and turquoise combo always makes happy! To begin this card, I gold heat embossed image from Altenew Needlework Motif Stamp Set using Altenew Rose Gold EP onto turquoise card stock. I die cut it with coordinating die and colored with Prismacolor colored pencils. I white embossed a sentiment from same stamp set onto black card stock and trimmed down as shown. I stacked up turquoise, gold glitter and white card stock and mounted colored flower and sentiment. I used Altenew Needlework Motif Stamp Set again for my final card. First, I white heat embossed the flower onto teal card stock and colored with Prismacolor colored pencils. I die cut left edge of this panel using Altenew Creative Edges : Lace Die and popped it up on purple card stock using craft foam. I then pulled out Altenew Floral Alphabet Stamp Set and white heat embossed 'L' onto a piece of black paper and die cut with Altenew Floral Alphabet Die Set. 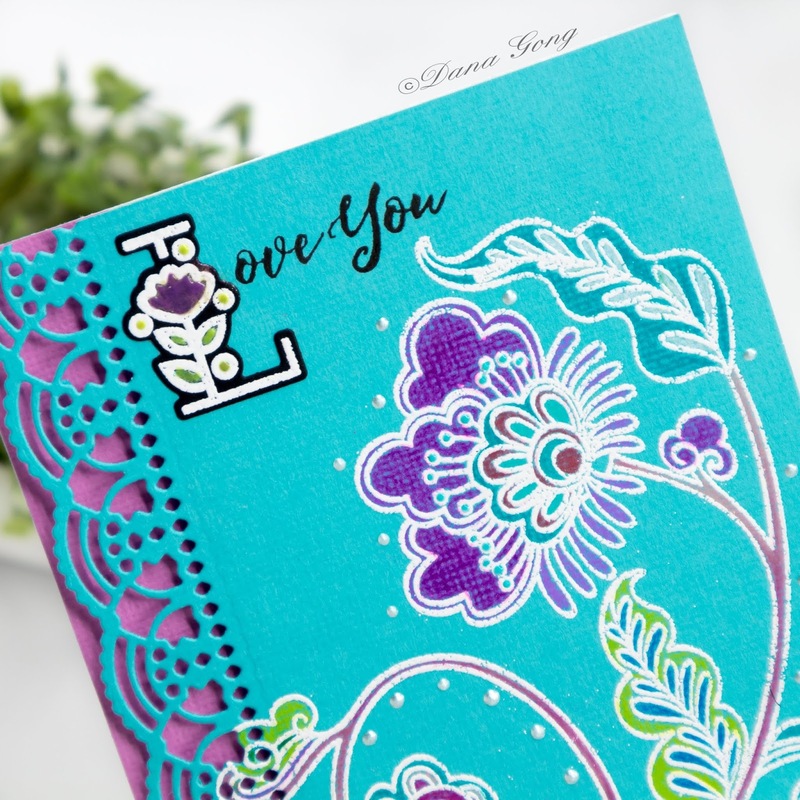 Original 'Love you' sentiment is from Altenew Forever and Always Stamp Set and I partial stamped it as shown to combine it with beautiful 'L'. I applied some Nuvo Crystal Drops to small flower and leaves. To finish, I added pearl dots around flower image using Ranger Liquid Pearls White Opal. Hope you enjoyed these cards. Thank you so much for joining me today! 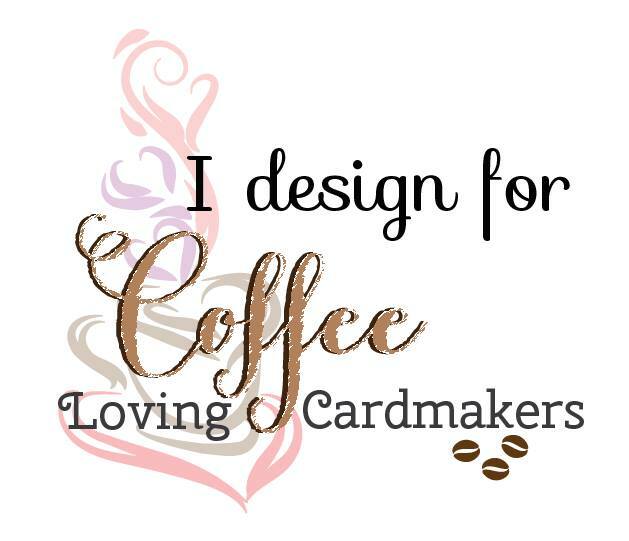 I'm also giving away a $30 gift certificate for my blog readers. To be a winner, 1) Follow or subscribe my blog (in the right side or below) 2) Leave a comment in this post and let me know if you are a new or continuous follower. Winner will be announced on July 25th on my blog with announcement label. Good luck, everyone! Your next stop is Flora Monika Farkas's blog! Happy hopping! Wow Dana. You really outdid yourself today! Amazing cards!! Awesome cards! I especially like the first one. :) I am an old follower. 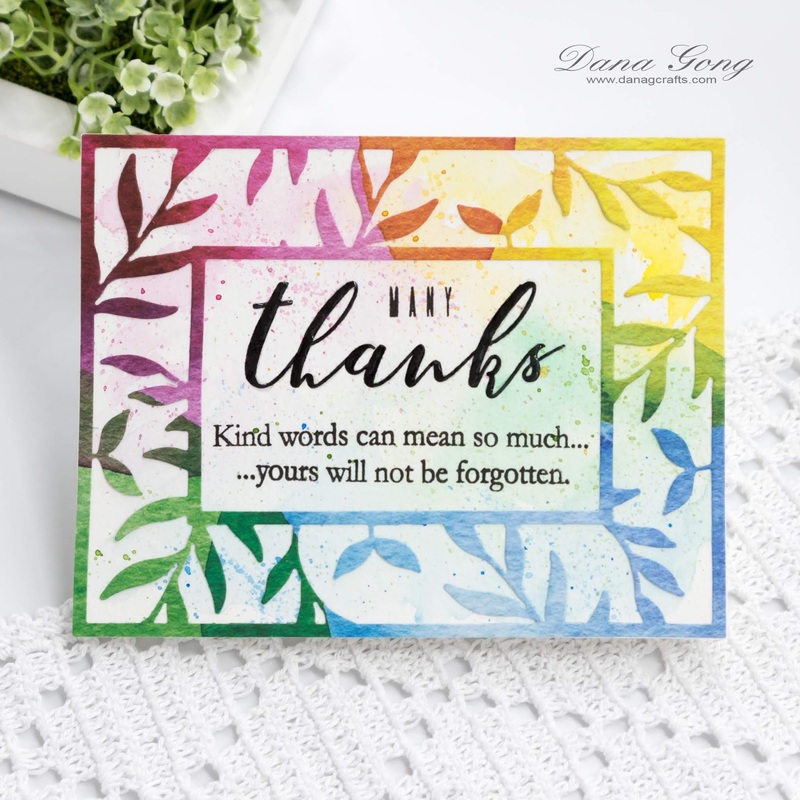 I love your use of the leaf frame die with the watercolor paper! Oh, and I am a new follower! I'm a new follower! Love the cards- such a gorgeous variety of styles! Wow! Beautiful cards...my favorite is the one with the rainbow colored leaf frame!! Lovely designs Dana! I recently started to follow you and find your projects inspiring! 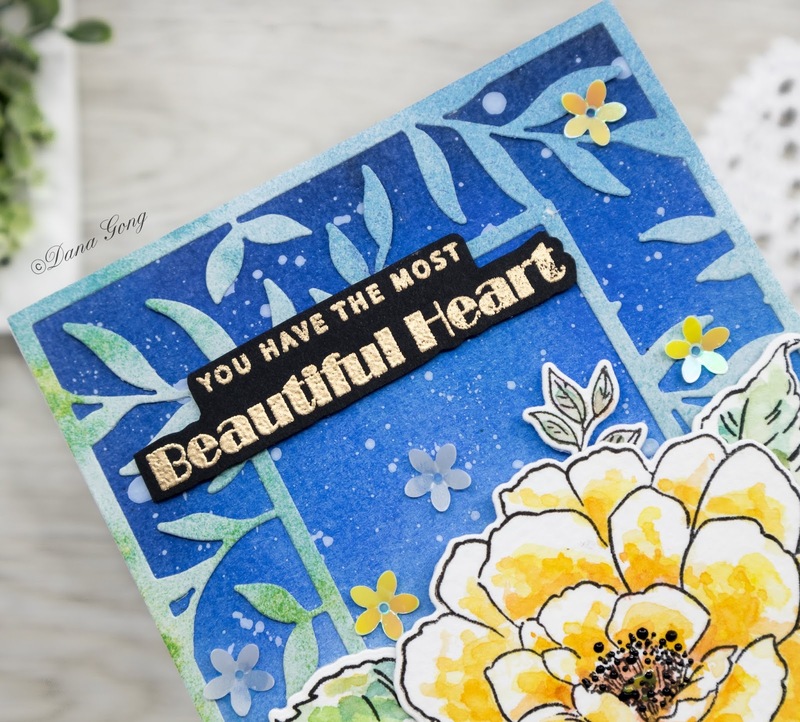 Love the florals, sentiments and dies in this new release! Thanks for sharing! O my gosh, these are all so beautiful, Dana! 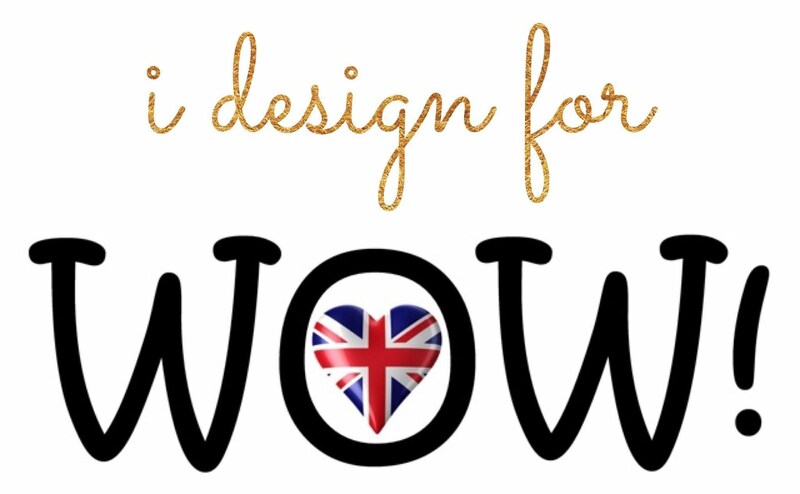 I love the way yo used the Leaf Border die, and the Embroidery Motif stamp set! Stunning art and so much inspiration! my favorite. But I love them all - so gorgeous!! LOVE how you used the leaf frame!!! Love the needlework motif cards! wow!! gorgeous cards!! love them all!! 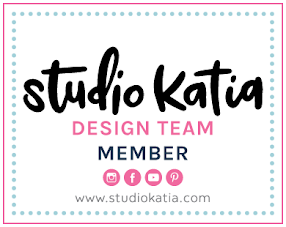 Hi - I'm new to your blog - started with one person and just followed the entire blog hop.. Loved the last card the best (purple fan) but all were terrific. Thanks for sharing so many wonderful cards. Such great inspiration! I think that Needlework Motif stamp set definitely has to be in my future! Every card I see using the Beautiful Heart set is beautiful and yours is no exception. Great job! Beautiful cards! I love the beautiful heart set! Thanks for the inspiration! 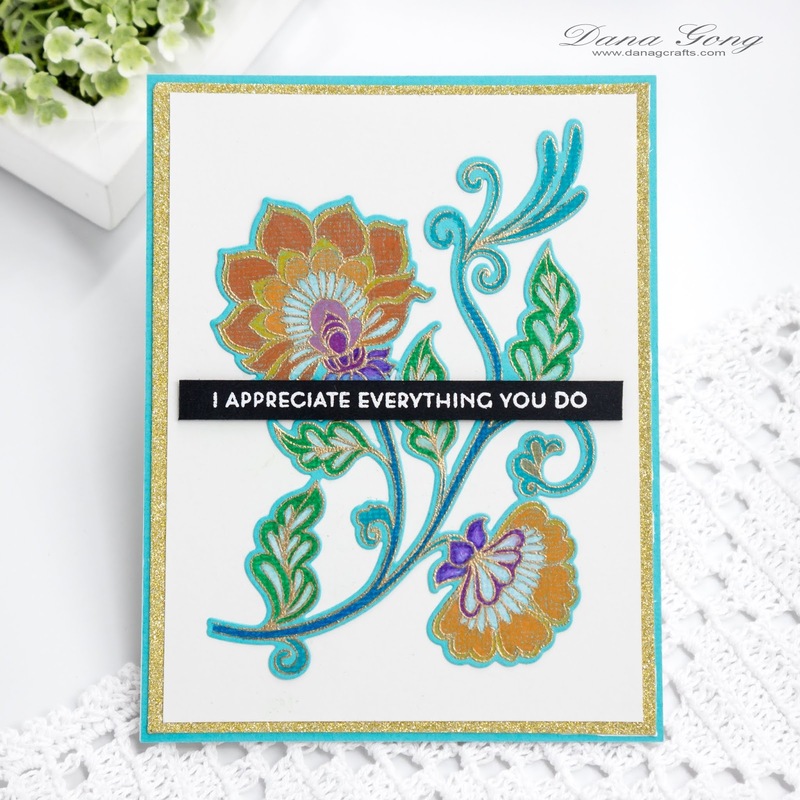 Beautiful cards, colors and release - love what you've done! Not sure if I've seen you with Altenew before so this might be my first time visiting. Your backgrounds are amazing! I am a new subscriber! Just gorgeous! New follower here! Very pretty cards. Love the new release from Altenew. WOW Dana, you have really done this release justice, what gorgeous cards. 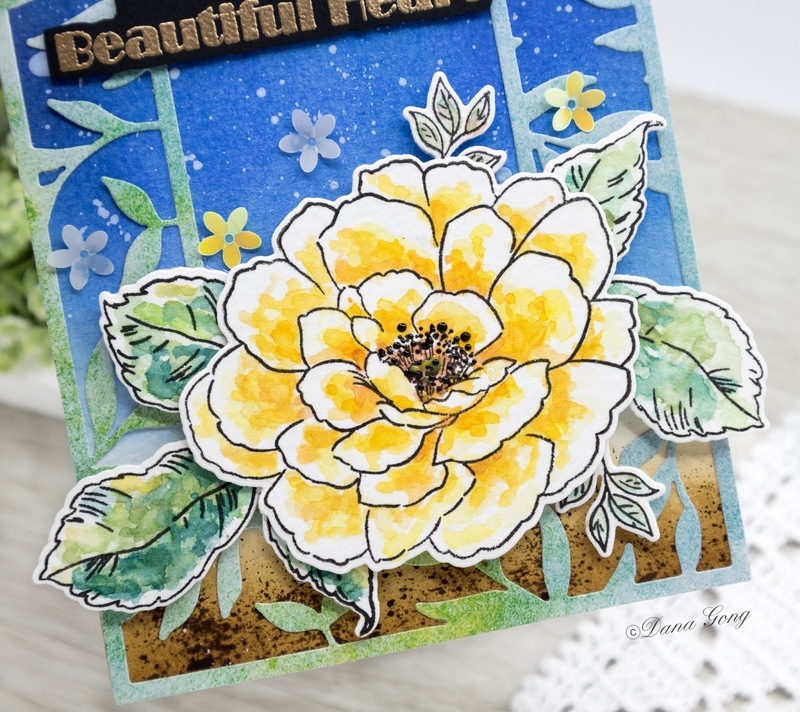 I am over the moon with this Leaf Frame die and LOVE how you used it on so many of the cards.What a beautiful and versatile die. I too love the gold/turquoise colours together, its a stunning combo and it looks fantastic with the Needlework set on that card. I am a relatively new subscriber. Love your work! Your cards are beautiful. I especially like the first one and the last one. Dana, these are so gorgeous! I love ll this beautiful color and the designs are all so fresh and fun! These cards are gorgeous, Dana! The coloring is exquisite and I love your designs. Your beautiful heart flower just pops right off the page! Thanks for the inspiration. I thought I was a follower, but guess not, so I signed up again! Gorgeous cards, I love the leafy frame die cuts, so pretty, and the pencil coloring on the Needlework Motif flowers is amazing! I so love your fourth card with the gold & turquoise colours using the Needlework Motif set!! It is my favourite stamp set in this release. Anything with Jacobean pattern appeals to me. This release is amazing! I want everything!!! Absolutely gorgeous cards!!! Wonderful creations dear! 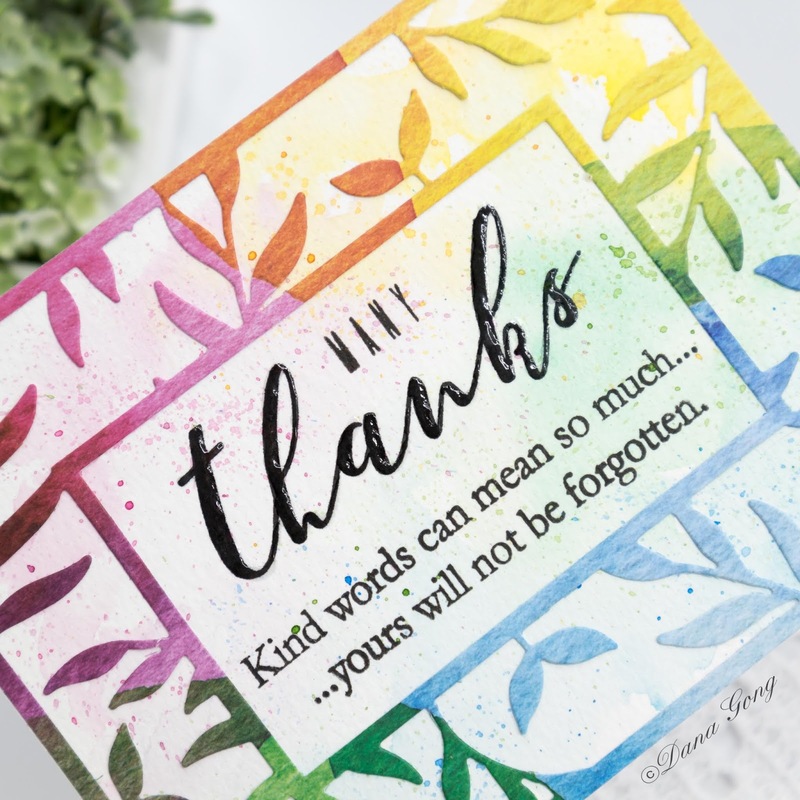 Lovely colorful cards...I am new to your blog. Very pretty cards! I really love your use of the leafy frame set. Beautiful cards!!! Thanks for sharing. Your cards are stunning and very elegant ! Thank you for sharing your creativity with us. Great release and I love the gorgeous inspiration! Especially love the cards with the Leaf Frame. I am a new follower. I'm a new follower (and glad to be). I love your use of color...especially how you used the leaf frame. Beautiful cards. The first two use my two favorites from this fantastic release -- Beautiful Heart and the Leaf Frame. I am a new follower. 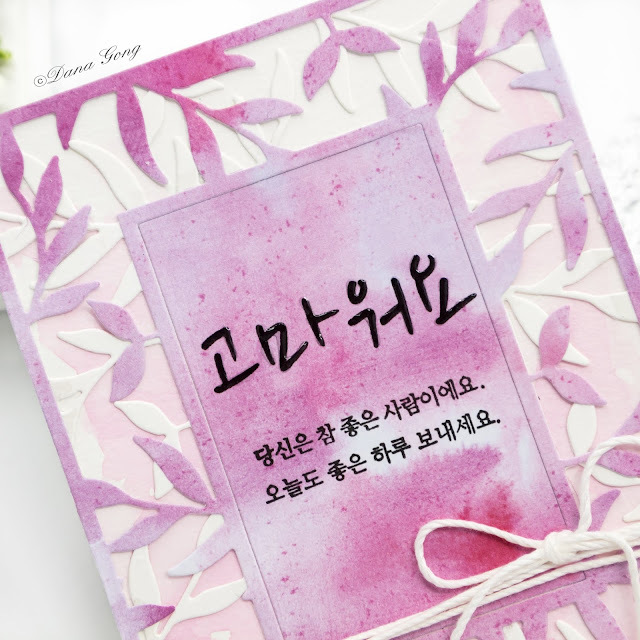 My daughter in law is Korean and I would love to make her cards in her language. Love your designs. Wow, amazing cards! Stunning colors and designs. Absolutely gorgeous! especially love that leaf frame die and the cards you have created with it! Your cards are really pretty! I also love teal and gold together - such an elegant combination. Thank you for sharing in the blog hop today - great inspiration! Such pretty cards! Love the variety and the mix of them. 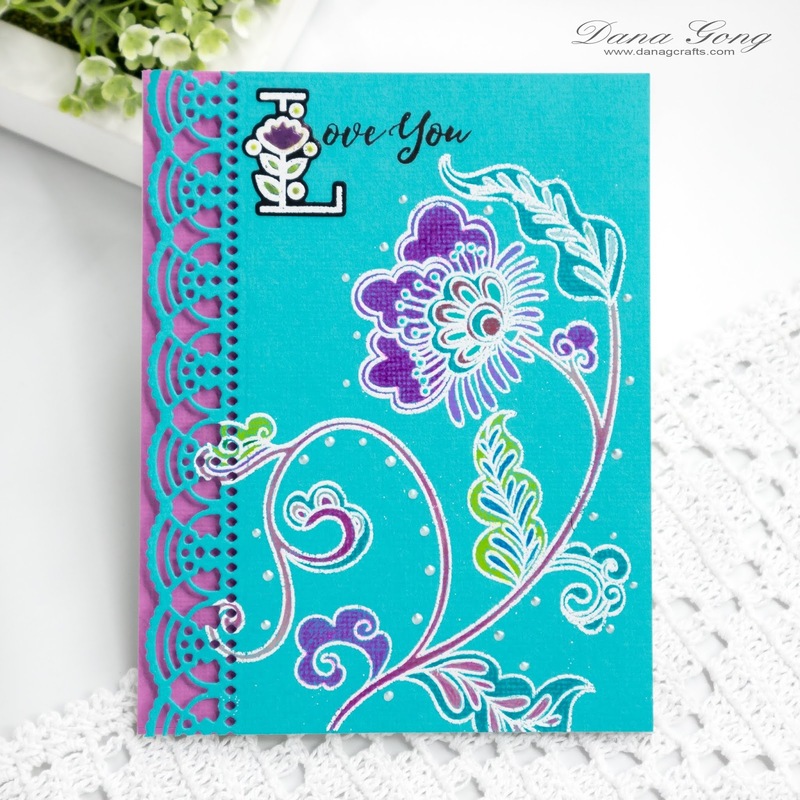 My favorite is the one with the embroidered flower stamp set, I love the detail and delicacy of those images! Wow, gorgeous cards! My favorite is the lavender one with the two leaf frames cover dies. 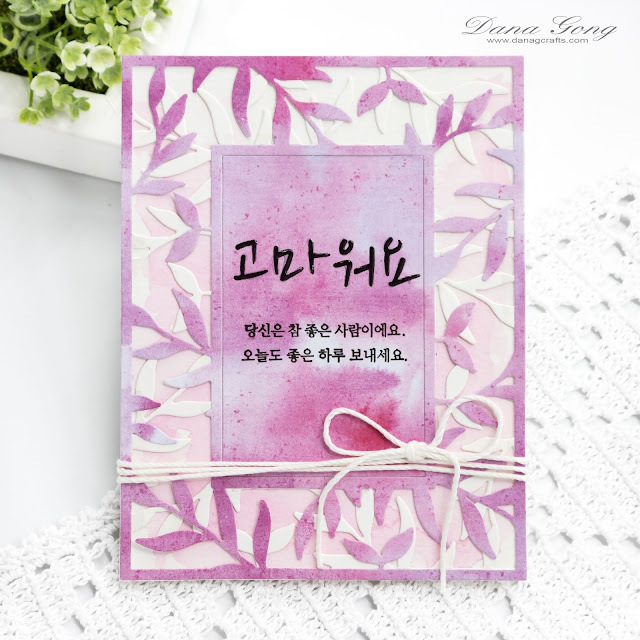 I love the layered look and the Korean handwriting is beautiful! These are such beautiful cards! I am a new follower. Awesome projects! Great product release! I especially love the cards made with the Leaf Frame Cover Die! Wonderful cards. I am already a follower. I am a recent follower (not my first time here but long overdue to be here lol). Your projects are beautiful, I love them all! OH I love the rainbow background! I am so HAPPY to be a new follower! Your cards are fabulous! Love them all. Lovely cards! My favorite one is the one using the Needlework Motif set in turquoise and gold. Gorgeous cards! 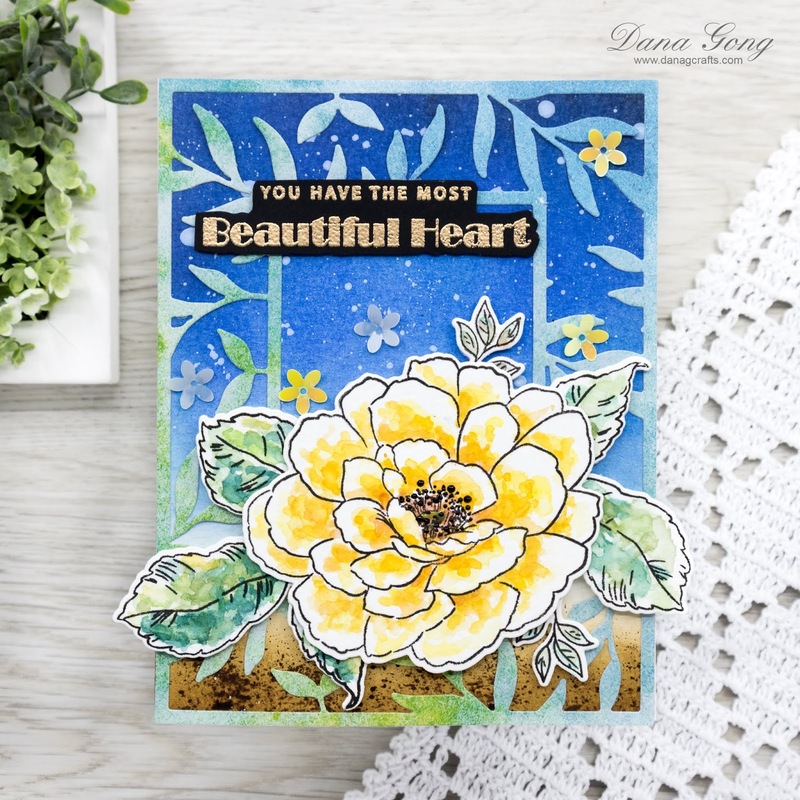 Love the Beautiful Heart stamp set and that awesome leaf frame die... can't wait to choose some new things from this release! I am a continuous follower here! Love your bright vibrant cards....especially the framed thank you card! 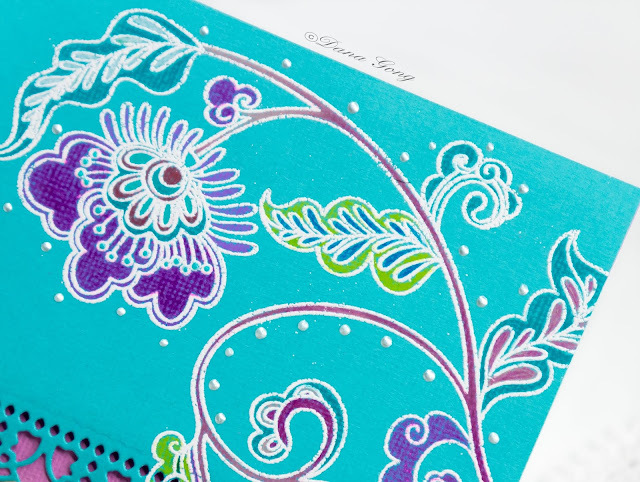 The needlework motif stamp set is my absolute favorite and I LOVE the vibrant colors you choose to use with it! Beautiful! Your cards are absolutely beautiful Dana...I love them !!! Very nice cards! I love the first flower!! Your cards really inspire me to use different colors and make flowers more vibrant. Beautiful cards! I love the cards with the leaf frame cover die - so many great designs with it! I do not think I am currently a follower, although I do follow your Altenew posts, and I think that I really do need to be a follower if I'm not. 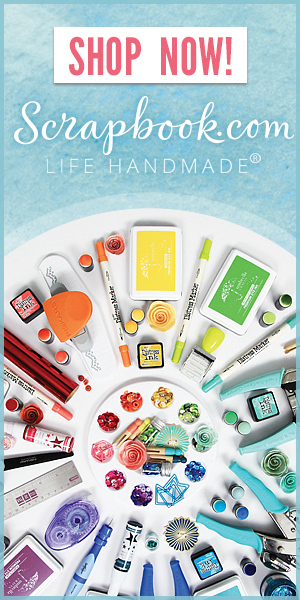 Wonderful new products and your creations are amazing! Thanks for the inspiration!